Berkshire, Buckinghamshire, Oxfordshire in England Farmshops: Find a local farms market near you in Berkshire, Buckinghamshire, Oxfordshire in England for fruit, vegetables, pumpkins, organic foods,local produce and more! Looking for a local, true farmer's market in Berkshire, Buckinghamshire, Oxfordshire in England? Scroll down this page and you will see the farm markets, farm stands, roadside stands, produce markets, even garden fruit and vegetable stands and seasonal community farmer's markets in Berkshire, Buckinghamshire, Oxfordshire in England, sorted by county. Markets offering organic or sustainably grown produce are identified by the words "organic" and/or "sustainable" in Green, next to their name. If they have a website, the name will be in blue and underlined; click on it and it will open their website. Hildred's PYO - asparagus, strawberries, raspberries, gooseberries, currants and flowers. Billet Lane, Iver, Buckinghamshire, SL0 0LU. Phone: 01753 652727.Email: copasfarms@copasfarms.co.uk. or fruit@copasfarms.co.uk. Copas Farms operates two Pick Your Own farms which collectively extend to 83 acres. Directions: One is located on the outskirts of Cookham in Berkshire and the other at Iver, near Slough in Buckinghamshire. Directions to Calves lane farm Iver. 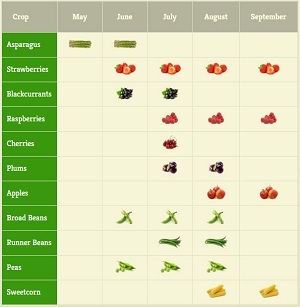 Open: A wide range of fruit and vegetables are grown, the season beginning with asparagus in late April/early May and finishing with apples in September. Before you set out for it is advisable to telephone the 24-Hour in-season Message Line (outgoing message only) Tel: (01753) 652727. The Message Line will give up-to-date information, taking into account any variants on the standard Opening Times due to weather etc. Last entry for picking is ONE HOUR before closing. A minimum charge of £2 for Adults and £1 for Children(depending on availability of crops) is made to enter the PYO fields. This is only refundable off produce you pick yourself. School visits by appointment welcomed. Telephone: 01234 711464. PYO and Farm shop. Honey. Other shops on site include Bacchus wines. Open 7 days a week 9.30am-7.30pm. Other shops on site include wines and kitchwareshop. Medley Manor Farm - UK Asparagus, followed by Broad Beans, followed by Strawberries. Kingston Road, Frilford, near Abingdon, Oxfordshire, OX13 5HB. Phone: 01865 391555. Email: enquiries@milletsfarm.co.uk. Open: May to October. Millets Farm has over 50 acres of crops exclusively for pick-your-own harvesting. 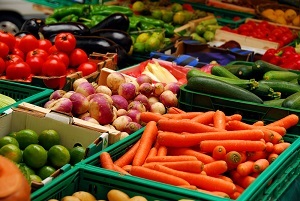 A choice of over 30 different fruits and vegetables can be picked throughout the warmer months and many new varieties of certain crops mean that they are available for a greatly extended season. Pick your own, meet farmyard animals, buy plants and have a go at the jungle maze. The Pick Your Own fields are open daily from 9am to 5.30pm. Rectory Farm - UK Blackcurrants, redcurrants, strawberries, raspberries, gooseberries, Tayberries, beetroot, asparagus, lettuce, broad beans, broccoli, cabbage, carrots, cauliflower, French beans, mange-tout, peas, sugar-snap peas, potato, pumpkins.